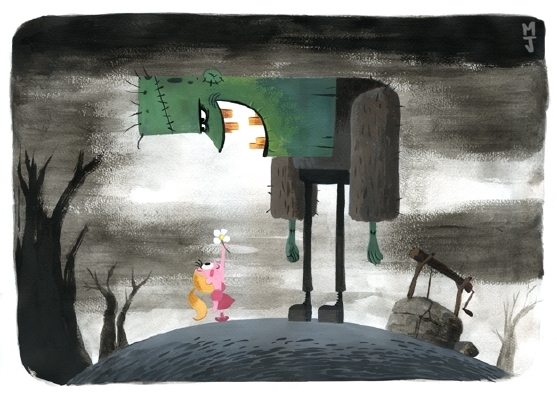 The great Frankenstein and The Flower Girl drawing above is by Matt Jones. Check his blog, Matt has posted his sketches, giving us a rare and fascinating “making of” glimpse into his creative process. The drawing was made for the Gum or Mints art-challenge blog where some very talented artists meet. Halloween coming up, the appropriate theme for the month was Frankenstein and there are some truly outstanding pieces to be seen there, using various media. Among others, there’s a great 3-D piece by Jim Valeri, and some striking photo-collages by “The Butcher” (and more to see in that style on his delightful blog). Especially noteworthy is Matt Cruickshank’s stark black and white storytelling approach, which I plan to revisit soon as I get some extra info from the artist. There are the makings of a singular graphic novel here. 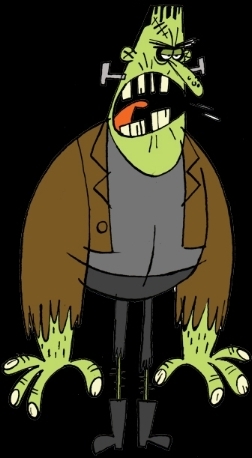 The splendid Frankenstein cartoon at left is by Dan Thompson, whose personal blog is also a knockout. Don't miss the Gums or Mints Frankenstein challenge. It's a trick AND a treat! Your blog is getting better and better -- fit sibling to mine. Thanks for carrying and recommending my book, too. Matt Jones' Flower Girl drawing kind of reminds me of my first date. :) Great stuff, as usual, thanks.